Dumbo is a true Disney classic, and I'm sure is an easily recognizable name to just about everyone, bringing up the image of a kid elephant with giant ears. Well, thats about all I knew about Dumbo, as I hadn't seen the film since I was a little kid. So I learned a couple things, such as the name "Dumbo" was actually an insult; the little tike's name was actually Jumbo Jr. Also, he doesn't talk. Dumbo is completely mute through the whole movie. There isn't a whole lot of dialog in general, and most of it comes from Dumbo's little mouse friend, Timothy. Oh yeah, and the movie is very short for a feature film, clocking in at only a few minutes over one hour, and those few minutes are easily chewed up by the opening credits (yeah, the credits used to come on before the movie started). The movie starts out with storks delivering babies of various species to circus animals, and everyone is happy to receive their little ones, except for the elephant Ms. Jumbo, who waits expectantly for her child to be delivered only to be disappointed when all the animals are loaded onto the circus and her young one does not arrive. For whatever reason, the stork delivering Jumbo Jr. was just late, but catches up to Ms. Dumbo on the train ride. At first all the other elephants are delighted to see her newborn son, but then quickly turn mean-spirited, making fun of Jumbo Jr.'s overly large ears once they're revealed. Talk about insensitive! They even give him the nickname "Dumbo"! Later, kids start making fun of Dumbo, and when they start to get physical mother Jumbo gets furious, and unfortunately this lands Miss Jumbo locked up away from everyone, including her son. So Dumbo feels completely alone, an outcast that nobody likes. But a little mouse named Timothy likes Dumbo's large ears, and the two become friends. Timothy tries hard to make Dumbo feel good about himself, but it's not until the two accidentally get drunk and find themselves up in a tree after waking from their alcohol induced imaginations that Dumbo find out his ears give him the power of flight! Recognizing what a talent his friend has, Timothy helps Dumbo utilize his ability to give him confidence and pride in who he is. It is a sweet story about an outcast who finds his talent and comes to accept himself. Personally, though, I didn't enjoy it as much as I thought I would. The surreal scene when Dumbo and Timothy are drunk I just found dull, though I'm sure many others probably found it remarkable. I did enjoy the scenes with the clowns, as those clown gags were pretty funny, but most of the rest of the movie didn't hold my interest. And I wasn't too impressed with the songs either. Sorry all you Dumbo fans out there, but I just wasn't feeling this one. 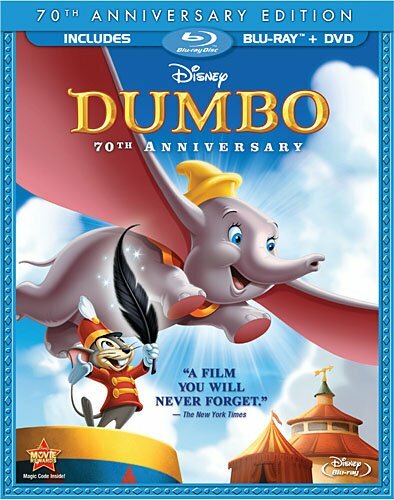 This 70th Anniversary Edition DVD contains more than just the movie, though, and I liked the extra features.There is a deleted scene involving Timothy telling Dumbo the story of why elephants are scared of mice. Then there's a featurette called "Taking Flight: The Making of Dumbo" which is quite interesting and informational. A featurette called "The Magic of Dumbo: A Ride of Passage" shows the Dumbo ride at Disneyland, past and present. Then there's this weird featurette called Sound Design Excerpt From "The Reluctant Dragon" which shows people doing sound effects for the movie, but it's not how they really do the sound effects, it's more like what a kid would imagine how they would do the sound effects. And then lastly there is an introduction by Walt Disney. The Blu-ray version has even more features, including games, animated shorts, and more exclusive features, but since I don't have a Blu-ray player I unfortunately cannot review those. So this is a very nice release, but I'm just not a fan of the movie.